What is the cost of ‘sharing’? It’s natural to have differing opinions. When working on any major project/website it is to be expected. Honestly, I would say that it is a bad sign if everyone agrees on everything. Lately, I’ve been giving a lot of thought to one specific discussion that has come up in every web project that I’ve ever worked on. This discussion seems to be more common on eCommerce websites, but I’ve experienced it in almost all types of digital projects (even iPhone apps!). The client’s demand for social media sharing. A few years ago, I had the opportunity to consult for one of the largest retailers and was tasked with the redesign of their department and category pages. Although the scope of the project didn’t include the product pages, the discussion of social media sharing became a hot topic for them. After we had finished the design and everything was laid out, someone mentioned that the page was lacking social media sharing icons. I diplomatically asked them why we needed the option to share “Product Y” to Facebook. The answer was simple — it drives traffic. When I asked them to share the statistics on how much traffic comes from social media/shared content, the answer I got was that they don’t really know but ‘imagine’ that it’s a fair amount. My experience and the data show that’s not always true. The other response that I sometimes get is that it does ‘no harm’ to have them there. I can understand this argument, but I have to disagree. The whitespace of a website is a vital part of every high-converting page. Project managers are hard to convince of this concept. They have an imaginary checklist in their head that has ‘social media enabled’ as a box needing to be checked and whitespace as a place where that would naturally go. Would I ever share this content? Do I know anyone that I think would share this content? Would my followers enjoy this content? Would this be something that I would normally share publicly? The vast majority of the time, the answer to all of these questions would be no. According to the social media planning framework, KUDOS, how useful information is should guide how it is shared. It could actually be harmful to your brand if you are not careful. So, back to my client. I think it’s pretty safe to say that most people wouldn’t want to ‘share’ the bookshelf they are looking at buying with all of their Twitter followers. There really isn’t a situation where sharing a kitchen door knob on Facebook would be useful. This company, however, has made it exceedingly easy to do all this sharing. You can use their custom built ‘share’ button to email the page to someone or share the product to Facebook and Twitter. Great. But they didn’t stop there. You can also share it to Google+, pin it on Pinterest (to be fair, this one isn’t such a bad idea), and if you missed the first ‘Share’ buttons, you ALSO get the ‘Share to Facebook’ and ‘Like on Facebook’ buttons from Facebook itself. Why anyone would ‘like’ a kitchen door knob is beyond me. So, imagine my excitement when I read Eric Mobley’s excellent post on how social media share buttons impact your website’s loading speed and performance. He took the time to perform tests with blank pages and measured the page load of different social media sharing options. Addthis.com, one such option, added around 500kb of extra data to your your page. Dependant on the connection, it’s safe to assume that your customer will be waiting for at least one extra second for just those icons. It absolutely validates the argument that there is a cost to adding that option. When designing webpages and online experiences we need to consider everything — load time included. 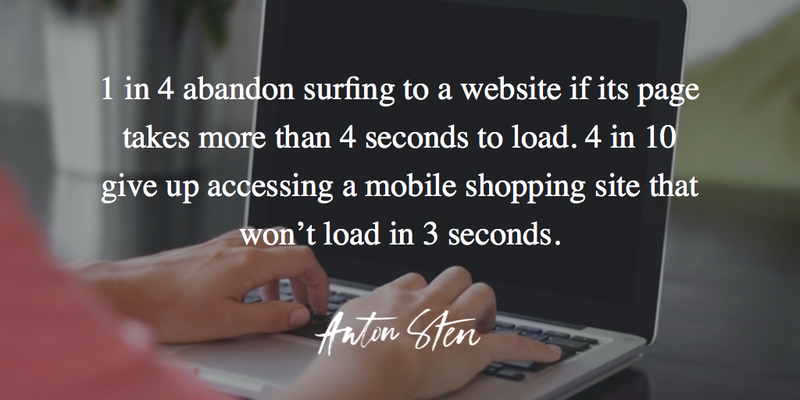 For example, one in four people abandons surfing to a website if its page takes longer than four seconds to load. 4 in 10 Americans give up accessing a mobile shopping site that won’t load in just 3 seconds (which is roughly the time taken to read to the period at the end of this sentence). Crazy, given that shopping sites tend to have to be image-centric, and thus may take longer to load. For a large e-commerce company like Amazon, this could total $1.6 billion of lost sales each year. That’s a HUGE number. Adding social media sharing buttons or anything that isn’t really necessary may just hurt your bottom line. Is it worth it? Designing with data has become a popular subject for the last few years and a focus for what I do. The more information you have, the easier it will be to calculate the optimal page design. Does this ‘share’ button really improve page hits more than the cost of that additional second of load time? Does it actually lead to more conversions? For designers, I think it will be necessary to weigh all of these different decisions against one another. It is key to understand exactly what the business goals are and what drives those goals. So, here’s some free advice. Remove one of your sharing icon sets and utilize some A/B testing to see how you are really converting and what traffic is actually generated from social media. The results may surprise you. ← Working with UX-designers and getting results!